We shall be adding profiles to this list at regular intervall. If you know of needy individuals who you think might be included, please let us know. Cordelle is working again in the bakery. Up to now he was not able to rebuild his home, since his income is too low for a loan by the bank. He has been a baker for five years, getting up at two in the morning to make bread and pastries from 2.30 ˆ 11.00 a.m.
On the day of the hurricane, he was in St. Lucia on vacation. 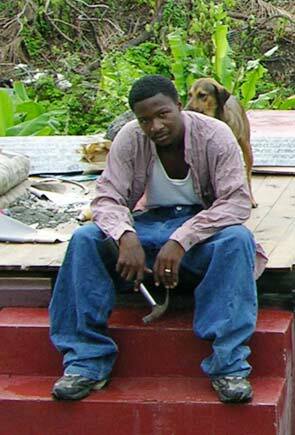 Because the Grenada airport was closed, he could not return home for three days. He found that the two-bedroomed house where he lived with his mother had been trashed. Nothing was left except a few pieces of clothing. Everything else was spoiled. All he had remaining was the luggage he had taken on holiday. For a few days, he and his mother slept with friends. There was no privacy, little room and inadequate WC facilities. After a few nights with other friends (whose roof leaked), he has been lent a room in a house while the owner is abroad: but water flows into that too. He is at present without any income, because the bakery lost its roof, and all the equipment was damaged. 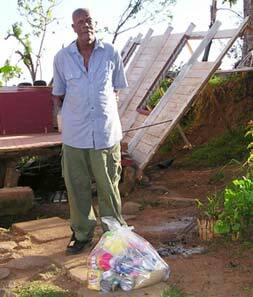 Despite his own misfortunes, Cordelle willingly joins us in the distribution of food to others. This is Lynette. She lives in St. David's, in what remains of her home. 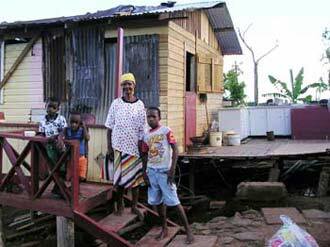 Her house is currently occupied by ten people, because their homes have been demolished. Lynette used to work at the Arawak Islands factory/shop, selling perfumes, soaps and spices. Most of her customers were tourists. She currently has neither goods to sell, customers to buy, nor a place to sell them from! Please do what you can to help Lynette, and many in her predicament. Arawak island has relocated their factory to Frequente and it is operating & functioning again. 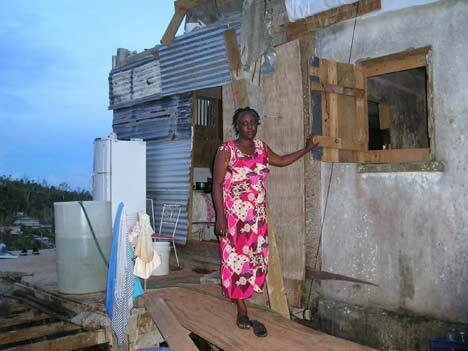 Lynette has her job back and hopes that she will be able to save some money to rebuilt her home. This is Marcelle, with her her mother Sandra, and her family, which is rather more extended than usual: there are currenty seventeen in one house. The reason can be seen behind them: 'Ivan' smashed many of their neighbours' houses to matchsticks. 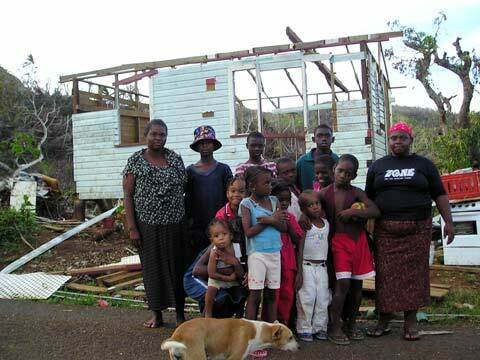 Sandra's and Marcelle's house itself has a large piece of roof missing,and most windows have gone. Sandra and Marcelle have only seen one aid delivery. Sandra used to make a living sellng the abundant local fruit and vegetables in the St. George's Saturday market, but now the trees have been stripped bare: nothing to sell, and nothing for the family to eat. She lives at the end of a little unmade road in a really remote area. She was alone in her wooden house during Ivan. Because of her experience with Janet in 1955, she took shelter under her table while her house crashed around her. 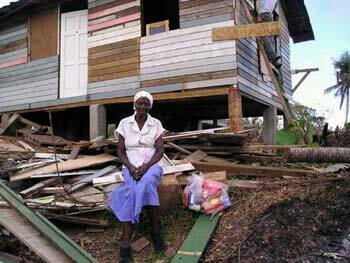 You can see her grandson's feet to the right, rebuilding her house. We brought Eda her first food on 23.10.04. She had seen no food deliveries whatsoever before we came. lives alone at the end of a dirt track off a very remote side road. „I got a special packet from our area representative, because the truck don't reach. But it didn't last! He is a gentle, uncomplaining man, who repeatedly thanked us for the food, and asked us to pass on his warmest thanks to those who had given it.